The writer Henri Charrière, called Papillon, became world-famous with his partly biographical, partly fictitious roman "Papillon" and the filming of the same mane from 1973 with Steve McQueen and Dustin Hoffman set a cinematical monument for his work. The movie was nominated for an Oscar in the category "Best Picture". The musical main theme was composed by the legendary Jerry Goldsmith. Henri Charrière grew up in Paris and at the age of ten he lost his mother. At the age of 17 he joined the French Navy and after the end of his period of service he was delinquent, among others as a safe-breaker. Finally he became implicated in a murder against a pimp and was convicted to banishment to French Guyayana lifelong in 1932. At the end of 1933 he came to the local penal colony where he got the nickname "Papillon" because of his tattoo on his breast. He soon attracted attention with several breakouts. Because the penal colony was located in the middle of the wilderness his outbreaks were not crowned with sucess at first but sometimes he was able to flee till Venezuela and Columbia and went into hiding by the indios for about seven months. Till today the experts argue in what way Henry Charrière really was involved in the outbreaks in his roman and how much are based on experiences from other fellow inmates. Only in 1944 his breakthrough succeeded on a bag full of coconuts and he reached British Guayana. Shortly afterwards he went to Venezuela were he was able to establish a new life, he even got the citizenship of Venezuela. He got married with a local and carried on several restaurants. When he published his roman "Papillon" in 1969 he soon got international recognition. Two years later he published his second roman called "Banco" which narrates his life after his release till 1970. Thank to his popularity he got a bigger movie role in the production "Popsy Pop" with Claudia Cardinale, for which he also wrote the script. 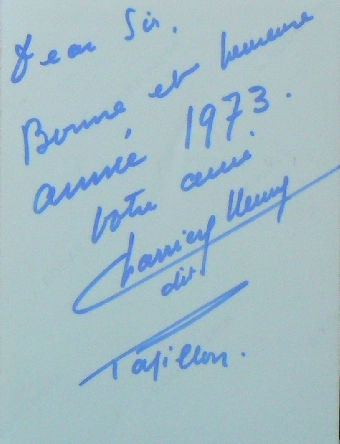 Only shortly after his huge success Henri Charrière died at the age of 67 from cancer of the throat in 1973.